New Kids on the Block. 98 Degrees. Boys II Men. Touring together. Try to contain your glee, 90s fans! 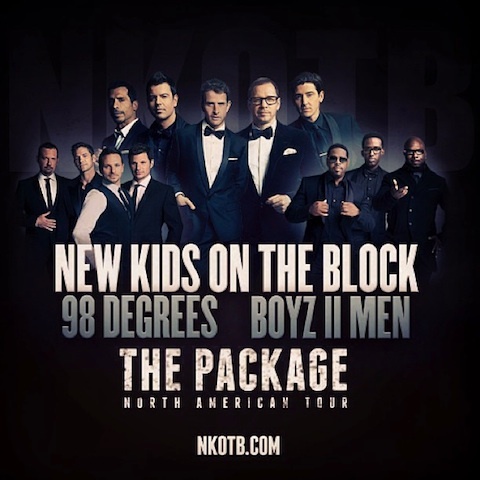 The announcement was made today that 98 Degrees and Boyz II Men would be opening for NKOTB on the group's upcoming "The Package Tour," which gets started in May of this year. There's also a new single and a new album on the way. The tour starts May 31 in Uncasville, Connecticut and moves on to Long Island after that, then Boston, Ottawa and a few other Canadian destinations, before returning back to the states. Tickets go on sale at TicketMaster on February 2 or Friday, January 25 for American Express card members and Thursday, January 24 for "Block Nation" members." According to Ryan Seacrest, actor/NKOTB-singer Donnie Wahlberg promises "plenty of surprises" for fans, and maybe even some special guests. “We’ll have plenty of surprises! With all those egos in one building at the same time! You know there’s going to be a lot of crazy and fun stuff going on. We’re gonna pull out a lot of surprises every night. We’re going to try and pull in as many special guests as we can, and do as many fun things as we can,” says Donnie. You can listen to the interview with Ryan Seacrest below. The photo promoting the tour comes courtesy of the NKOTB Facebook page. NKOTB and Boyz II Men peaked around the same time, with both groups hitting it big around the late-80s/early 90s. For NKOTB, it was Hangin' Tough that really put them on the map, while Boyz II Men got people's attention with Cooleyhighharmony. Both groups went on to record more albums throughout the 90s. On that timeline, that leads to the breakthrough of 98 Degrees in the later part of the decade. So those of us who weren't above jamming to pop music at any point during the decade likely know more than a few of these three groups' songs. With that in mind, it sounds like a really fun combination for a tour. Also announced today was NKOTB's new single "Remix (I Like The)," which will debut next week (January 28). Their new album 10 is set to arrive in April. So there's certainly plenty to look forward to if you're a fan of the group.